Lorrin Andrews Thurston was born on July 31, 1858 in Honolulu. His father was Asa Goodale Thurston and Sarah Andrews. On his father’s side he was grandson of Asa and Lucy Thurston of the Pioneer Company of missionaries; on his mother’s side, he was grandson of another early missionary, Lorrin Andrews. Thurston was fluent in the Hawaiian language and gave himself the nickname Kakina. He attended Oʻahu College (Punahou,) and, later, law school at Columbia University. He followed his father and became a member of the Hawaiʻi Legislature. In 1887, Thurston authored what became known as the Bayonet Constitution. He became the Minister of Interior. Ten years later Thurston’s first mark upon the Volcano landscape appeared. In 1889, using his position as Minister of the Interior, he oversaw the construction of an improved carriage road from Hilo to Volcano. In 1891, Thurston bought the Volcano House in the Island of Hawaiʻi. George Lycurgus first left his native Sparta in Greece around 1876, when he was about 17 years old. He served in the Greek Army for 18 months. George sailed from Greece to Liverpool sometime in 1880 and from there docked in New York. Here the young boy, not knowing any English, started out by selling lemons. The later found himself in San Francisco; however his brother John and a cousin, Peter Kamarinos, were in Hawaiʻi. By the fall of 1889, George was sailing on the ‘Australia’ to Hawaiʻi. “In 1893 Sans Souci was a rambling hostelry, nestled among the coconut and palm trees of Waikiki Beach. The guests occupied small bungalows, thatched-roof affairs about ten by twelve, the bed being the principal article of furniture. It was in one of these bungalows that Stevenson had established himself, propped up with pillows on the bed in his shirt-sleeves.” Scribner’s Magazine, August, 1926. Starting in 1906, Thurston, a revolutionist, and Lycurgus, a counter-revolutionist, started to work together to have the volcano area made into Hawaiʻi Volcanoes National Park. In January 1912, geologist Thomas Jaggar arrived to investigate the volcano. A building for scientific instruments was built in a small building next to the hotel. Jaggar stayed in Volcano for the next 28 years. Thurston and Lycurgus were instrumental in getting the volcano recognized as Hawaiʻi Volcanoes National Park. On August 1, 1916, President Woodrow Wilson signed the country’s 13th National Park into existence – Hawaiʻi National Park. At first, the park consisted of only the summits of Kīlauea and Mauna Loa on Hawaiʻi, and Haleakalā on Maui. Eventually, Kilauea Caldera was added to the park, followed by the forests of Mauna Loa, the Kaʻu Desert, the rain forest of Olaʻa and the Kalapana archaeological area of the Puna/Kaʻu Historic District. Before interisland air travel, competitors Wilder Steamship Co (1872) and Inter-Island Steam Navigation Co (1883) were the way to go. Wilder took you straight to Hilo; Interisland took a southern route around the Island to Punaluʻu. From there, folks rode a railroad to Pahala and then coaches hauled the visitors to the volcano from the Kaʻū side. At the age of 81, Lycurgus traveled to Washington, DC to have the construction of the new park headquarters building farther back from the lip of the crater. After another eruption in 1952, at the age of 93, he arranged a publicity stunt involving riding a horse to the rim of the erupting vent and tossing in his ceremonial bottle of gin. (The offering of gin became a regular at Volcano after that.) Uncle George died in 1960 at the age of 101. Nāhuku (the protuberances) is a lava cave, or more commonly called a lava tube. One of the most photographed lava tubes is Nāhuku in the Hawaiʻi Volcanoes National Park. It was found in 1913 by Lorrin Andrews Thurston (July 31, 1858 – May 11, 1931,) a local newspaper publisher, a lawyer, politician and businessman. Thurston was born and raised in the Kingdom of Hawaiʻi, grandson of the first Christian missionaries to Hawaiʻi. He played a prominent role in the overthrow of the Hawaiian Kingdom that replaced Queen Liliʻuokalani with the Republic of Hawaiʻi. But this story is about a cave in Volcano, not politics. Thurston and George Lycurgus (Uncle George) were instrumental in getting the volcano recognized as Hawaiʻi Volcanoes National Park. Starting in 1906, the two were working to have the Mauna Loa and Kilauea Volcanoes area so designated. In 1912, geologist Thomas Augustus Jaggar arrived to investigate and joined their effort. Eventually, Kīlauea Caldera was added to the park, followed by the forests of Mauna Loa, the Kaʻū Desert, the rain forest of Olaʻa and the Kalapana archaeological area of the Puna/Kaʻū Historic District. It is one of the very few readily-accessible lava caves/tubes for folks to see in Hawaiʻi. The cave has two openings used as an entrance/exit for the trail. The primary entrance is reached via a bridge. The cave/tube is lit with electric lights and has a flat rock floor. Hawaiʻi Volcanoes National Park is worth seeing, and a stop at Nāhuku (Thurston Lava Tube) is worth making, even if you have seen it a million times before. Enjoy this and other day hikes in the Park. 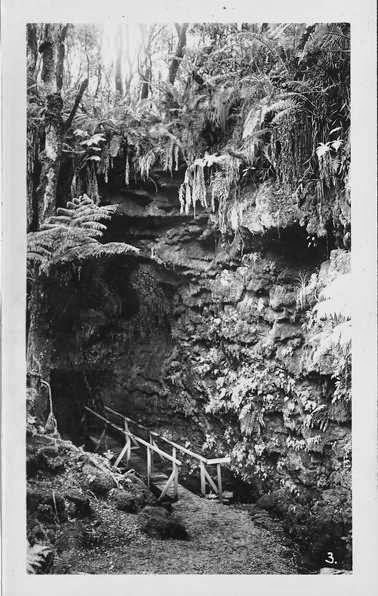 The image shows the entrance to Nāhuku (Thurston Lava Tube – 1940.) In addition, I have added other images in a folder of like name in the Photos section on my Facebook and Google+ pages.